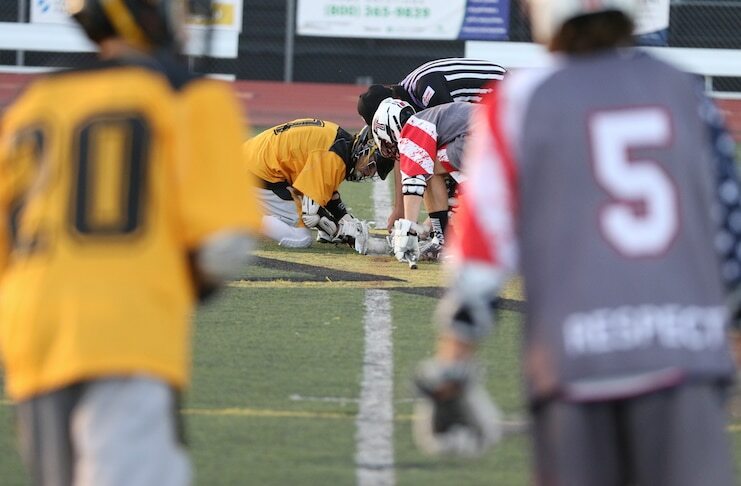 Tesoro boys lacrosse overcame a slow start to down Capistrano Valley 11-5 on Thursday night. Jason Moreta paced the Titans with five goals. The defeated ended Capo’s season opening win streak at three games. The first quarter was a see-saw affair with Jonathon Gibson (3A) putting the Titans on the board first with a quick stick on a loose ball. Gavin Gerbershagen (1G/1A) responded for the Cougars with a lefty step-down in a man-up situation to even the score. Luke Molinari (2G) pushed Tesoro back up on a feed from Ryan Harrington (1G/1A) making it a 2-1 game at the end of the first quarter. The slow scoring pace continued in the second quarter. Moreta scored his first two goals to open the quarter, the second coming off a nice feed from Carson Spooner (3A). With the Titans leading 4-1, it looked like Tesoro might run away with it. However, the Cougars wasted no time striking back with an unassisted goal by Mathew Blethen (3G) to cut the margin to 4-2 and slow down the momentum. The defenses took over for the rest of the half with neither team scoring. The Titans improved their groove in the third quarter with four unanswered goals. Freshman Mathew Harrington (1G) and older brother Ryan scored back to back goals, widening the spread 6-2. Jordan Walker (1G) kept the Tesoro momentum going on a fast break feed from Spooner to make it 7-2. Wth a minute left in the third, Gibson found Moreta who completed his tat trick with a step-down rocket, sniping the top shelf to end the quarter 8-2. Capo showed signs of a comeback when Blethen started the fourth quarter with a snipe of his own off a feed from Gerbershagen. Moreta and the Titans were in no mood for a comeback though and the Gibson-to-Moreta connection clicked two more times to to make it 10-3 to put the game out of reach. Capo continued to fight but it was too little too late. Blethan found top corner off a feed from Cameron Brault (1A) and Cole Darland (1G) made it 10-5 with an unassisted goal. Molinari ended the scoring for the evening after a feed from Spooner to end the game 11 to 5.